You can’t see the trees through the forest. 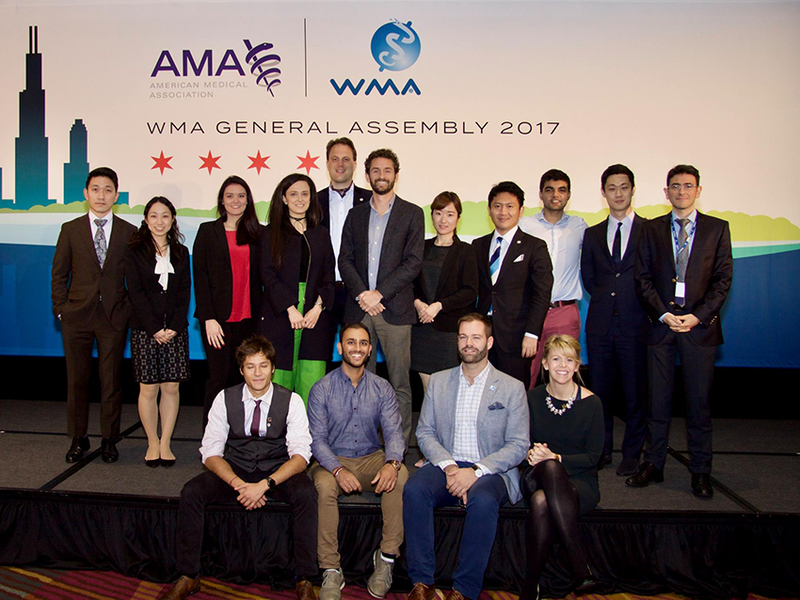 We had the remarkable opportunity to attend the Junior Doctor’s Network and World Medical Association general assembly meetings this year held in Chicago, Illinois. The World Medical Association is an international, independent body of doctors that has, since 1947, sought to promote human rights, public health, medical ethics, improve health systems, and advocate on behalf of its member nations globally. The Junior Doctors Network is a newer body of the World Medical Association. It consists of a group of young physicians, those of whom are within ten years of graduation from medical school. The Junior Doctors Network group works with the World Medical Association to tackle issues relevant to its members. We attended this meeting as representatives for the Resident Doctors of Canada. Stepping into this unfamiliar landscape, we quickly realized our experiences were limited to the post-graduate training in Toronto, and to some extent, Ontario and Canada. The benefits of this meeting were many. Our agenda involved facilitating and collaborating in workshops to develop ideas and formulate policy to put forth to the World Medical Association. We also participated in small-group sessions and lectures given by world leaders in the medical field on advocacy of important topics of relevance to junior doctors such as national and international leadership, medical education challenges and paradigm shifts, post-graduate research, physician wellbeing challenges, promoting action on antimicrobial resistance and creating short and long-term action plans for this international organization. Naturally, as you sit with a delegation of junior doctors who are championed advocates spanning across continents, you have a lot of “WOW” moments. We tend to think of doctors as this cookie cutter phenomenon and get lost in our daily hustle. However, the reality is very different; there is a vast diversity of physician experiences with each region of the world dealing with its own set of challenges stemming from healthcare resources, medical training environments, post graduate support amongst many others. There also remains however an element of congruency which leads us to talking about the global phenomenon of antimicrobial resistance. Antimicrobial stewardship (AMS) is a term that’s beginning to creep up into our training as resident physicians. Locally at Sunnybrook in Toronto we’ve been exposed to a large movement by the in house anti microbial stewardship team combatting inappropriate and non- specific antibiotic treatment protocols that are leading to strains of resistance and costly or even ineffective treatment. Going through medical school and residency training, we had a relatively good grasp of this concept but there was a larger component and worldwide movement that we were completely missing out on, and we imagine those reading this may be as well. The One Health movement was coined in the 2000s and falls under the Global Health Security Agenda. It describes a large body of evidence linking the health of human population with that of animal health and interventions, in addition to the surrounding ecosystem. The large body of discussion on day 1 of the Junior Doctors Network meeting looked at the issue of growing worldwide antimicrobial resistance in large affected significantly by the overuse of inappropriate antibiotic use in our livestock, specifically poultry, beef and pork. Much to my surprise, the human use of antibiotics is far surpassed by antibiotic use in animals. This argument was not an attack on antibiotics as a whole but instead on the practice of empirically treating healthy livestock with prophylaxis for disease prevention and growth purposes. To deal with AMR we have to backtrack and see where a large burden of the problem sits. We are seeing a rapid rise in resistance patterns of these antibiotics which do in fact carry over into the human side through ingestion of these meats, vectors carrying the resistant genomes, runoff water from farms and even through airborne mechanisms. The problem is we don’t have enough new antibiotics coming out to the market to compensate for these resistance patterns. The real concern is that as resistance grows we will be unable to treat basic infections resulting in deaths globally. Some believe it is currently the biggest threat to human health. Our guest speakers included local physicians at hospitals systems in the Chicago area who had successfully sparked change in the industry by getting involved with the supply chain. Work was done by Dr. Aparna Bole, sustainability advisor for University Hospitals of Cleveland, to get their local hospital system to source poultry from sources which limited antibiotic use to those livestock which demonstrate an ailment and are working to get beef and pork vendors on board as well. Part of our Canadian Can Meds roles revolve around a pillar of physician advocacy. I don’t expect that physicians will be the leading content experts in the area of antibiotic microbial biology but, we do have that unique responsibility and position to advocate for the care of our patients and our communities. We need to address this issue alongside our veterinarian colleagues and other community organizations. We obviously haven’t given the topic enough justice, but I do hope this sparked your interest to read more about this crucial issue and maybe even inspire some change in your local community organizations and practices. Just one more plug about wise prescribing practices, antibiotics are not benign medicines but can be lifesaving when used appropriately, so be sure to think about whether your patient would really benefit from the script you’re about to hand them. Also, if you can pay attention to the food you purchase – checking to see what’s antibiotic free. Dr. Saahil Vij is a PGY-2 Family Medicine Resident and Program Chief Resident at the University of Toronto, Department of Community and Family Medicine. He is also a PARO general council members. Dr. Vij loves to travel and lives to eat. He’s also super passionate about resident advocacy and medical education. Dr. Nauman Malik is a PGY-1 Radiation Oncology at University of Toronto, global health enthusiast, and aspiring advocate for physicians and patients worldwide.